Shark Defenders: Adopt A Bull Shark -- 6 Days Left! How many bull sharks can you fit into one frame? Conservation efforts such as ‘citizen science’ are an important part of positively engaging the public and increasing our understanding of sharks, both ecologically and economically. When you ADOPT A BULL SHARK, your generous, tax-deductible, donation helps fund ‘citizen science for sharks’ all over the world, including Fiji, Ecuador, Peru, and Indonesia; and supports the application of those efforts to local and international conservation actions. Why is this important? 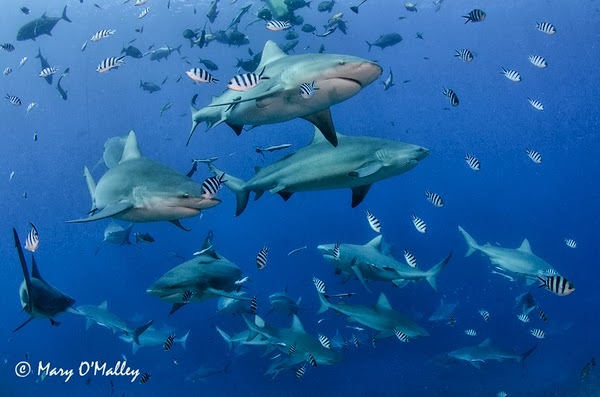 Many shark populations are declining worldwide often due to the demands from the international shark fin trade, as well as by-catch pressures from other fisheries. The reproduction rates of many large sharks make it difficult for their populations to rebound from such impacts. Depletion of apex predators can adversely impact our ocean ecosystems yet the perception of ‘shifting baselines’ can mask these depletions. Long-time divers often report seeing far fewer sharks today than when they first starting diving, decades ago. Please help support our work to empower divers to document their valuable shark sightings; ADOPT A BULL SHARK today! Indiegogo is a great platform because it allows supporters to give as little as just a few dollars. So, if you don't mind sparing that cup of coffee, please consider making a small -- or large -- donation to the great work of this organization.